Scintillating action is expected in this weekend’s Absa Premiership matches as club football returns. 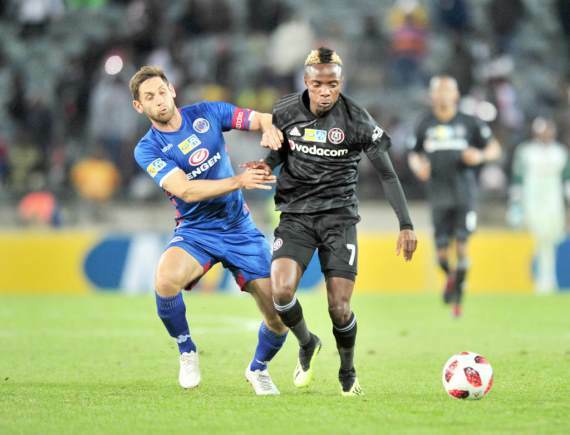 Orlando Pirates will be looking to break their 10-match hoodoo against SuperSport United while Kazier Chiefs visit high-flying Cape Town City. On Sunday, Maritzburg United will be looking for their first win of the campaign when they welcome top-placed Bidvest Wits to the Harry Gwala Stadium. Elsewhere, AmaZulu host Mamelodi Sundowns at King Zwelithini Stadium. It’s time to put my head on the block with predictions! Benni McCarthy’s Cape Town City have collected five out of a possible 14 points in their first four games and they will be banking on home ground advantage when they face Kaizer Chiefs on Saturday afternoon. They did superbly in the MTN8 before the international break, knocking both Mamelodi Sundowns and Maritzburg United out of the competition to reach the final. A lot is expected from newly-signed Tokelo Rantie and he could make his debut this Saturday. Kaizer Chiefs are winless in the league this season, having registered four draws and one defeat. They also crashed out of the MTN8 when they lost 3-2 on aggregate to SuperSport United. Lebohang Manyama could make his Chiefs debut against his former team. Still, my money is on Cape Town City. Eric Tinkler’s reign at the helm of Chippa United’s coaching department got off to losing start as they succumbed to a 2-1 defeat to SuperSport United. The Chilli boys are rooted to the foot of the table with one point in four games. Baroka have been inconsistent this season as they managed to beat on form Cape Town City and hold Kaizer Chiefs to a draw but came unstuck against AmaZulu and Polokwane City. Wedson Nyirenda’s men have signed Toriq Losper from Ajax Cape Town to bolster their midfield. I’m predicting a share of the spoils at the Sisa Dukashe Stadium. Maritzburg United, who are winless this season, face a stern test against top-placed Bidvest Wits. Siphesihle Ndlovu is suspended for the clash after receiving a red card against Kaizer Chiefs in their most recent game. Yannick Zakri is expected to make his first appearance for The Team of Choice. Bidvest Wits look determined to reclaim the title after having a terrific start to the season. The Clever Boys have won four of their five opening matches with new signings Deon Hotto, Mxolisi Macuphu and Gift Motupa scoring goals for fun. This should be a convincing victory for the visitors. Pirates have endured a turbulent start to the season, with two defeats, one draw and two wins. They face their hoodoo team which they haven’t beaten in the last 10 encounters across all competitions. Thamsanqa Gabuza is not available for selection after getting sent off in the recent 2-1 win against Black Leopards. SuperSport United come into this one off the back of a three-match winning streak in the league. They’ve also beaten the likes of Pirates and Kaizer Chiefs to reach the MTN8 final. Bradley Grobler and Dean Furman are in good form and they played for Bafana Bafana on Saturday. Pirates don’t win against SuperSport so I think it’s safe to back the visitors on the Double Chance here at 11/20. Heading into this clash, these sides have an identical record of one win, two defeats and one draw. Polokwane City were frustrated by Golden Arrows in their recent encounter which ended in a 1-1 draw. One the other hand, Free State Stars, who are currently third from the bottom, left with a point when they relinquished a 2-1 lead to draw level at 2-2 in injury time against Cape Town City. That equaliser was conceded in a comical fashion with goalkeeper Olivier Kwizera inadvertently turning it into his own net after it ricocheted off the crossbar. I foresee this one ending in a draw. Leopards lost 2-1 to Orlando Pirates last time out despite the Buccaneers playing with a man less from the 35th minute. This will be Lidoda Duvha’s first game at Thohoyandou Stadium as they’ve been given the greenlight by the PSL to utilise they usually fully-packed venue. Steve Komphela’s Celtic are yet to lose a game this season and they currently sit second on the table with 10 points out of 12. Young left-back Bongani Sam has been a revelation, the Ke Yona Team graduate scored the winner against Orlando Pirates and won the Man of the Match against Kaizer Chiefs. Get on Celtic to win this one comfortably. Highlands Park have drawn all four of their league games so far. Only one of those draws were goalless and in all the three score draws, The Lions of the North score first but fail to see matches out. This is the bad habit Owen da Gama’s men need to break if they want to survive in the elite league. Arrows are also winless in their last three games, including a 2-0 defeat to red hot Celtic. Limbikani Mzava, Divine Lunga, Knox Mutizwa and Danny Phiri are back from national duty and they must be fired up to help the team turn the corner. I’m backing Highlands Park to draw their fifth consecutive game here. AmaZulu have played four games so far, winning two and losing two. Both their wins were at home which shows that they want to maintain their good form at King Zwelithini Stadium. Sundowns are now fully focusing on the league after getting knocked out of the MTN8 and CAF Champions League within a space of a few days. Themba Zwane and Hlompho Kekana pulled out of the Bafana Bafana squad due to injuries last week. Pitso Mosimane has finally acquired the services of former Bidvest Wits and Al Ahly striker, Phakamani Mahlambi. Back a convincing Sundowns win.